Well? Mum? Are they cool yet? Can I eat them? Can I? Eh? Please? Are they cool yet? Can I have one? Mum? Please? Cookies? 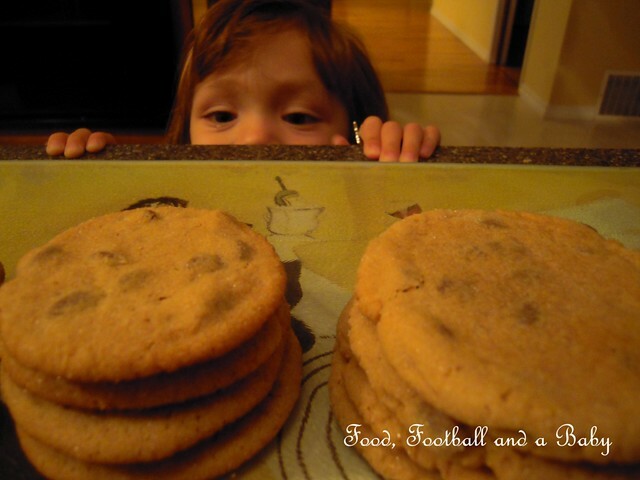 Chocolate chip ones? Please? Are they cool? Can I have one? Please mum? YES, really? Yummy! Anyway, before I get all consumed in my biscuit versus cookie battle, I better talk about the actual recipe itself. There is nothing as North American as a chocolate chip cookie, unless its peanut butter of course! The thing is, I am a heathen, and I don't actually like chocolate chip cookies, or peanut butter, for that matter. This recipe is based on one from Best of Bridge, however, I decided to tinker about with it, as I tend to do. Especially when I have stuff in the baking cupboard that really needs to be used up. 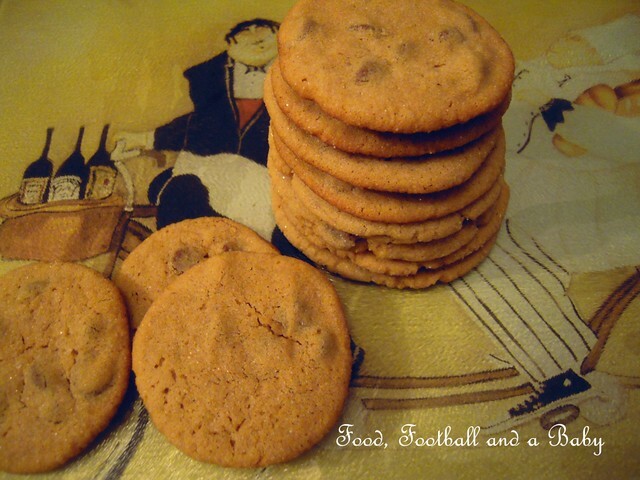 If you just want plain peanut butter cookies, see here. I made these with half butter/ half margarine, but feel free to use all butter for a really delicious biscuit. 1/3 cup self raising wholewheat flour (otherwise use plain) or just use 1 cup white. Let the butter and margarine soften, then whisk it with the sugar and egg till its nice and creamy. Add the peanut butter and stir hard using a wooden spoon. Then add the chocolate chips and the walnuts. Mix well. Mix the flour, baking powder and salt together, then add to the peanut butter mixture, combining well. The dough will be very soft. Using your fingers, shape into little balls (or big ones, depending on how big you like your cookies) Roll around in the granulated sugar. Store in a biscuit tin, and they freeze well too.